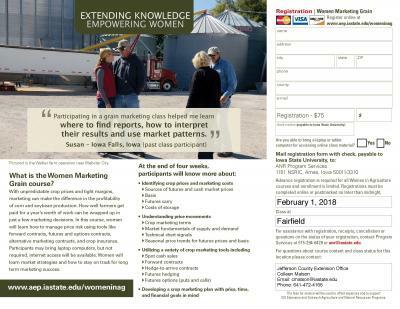 Iowa State University Extension and Outreach Women in Ag program is holding Women Marketing Grain beginning Thursday, February 8, 2018 in Fairfield, Iowa and continuing February 22, March 1, and March 8 from 6:00 p.m. - 9:00 p.m. with a meal served at 5:30 p.m. The classes will be held at Jefferson County Extension Office, 2906 West Burlington Ave., Fairfield, Iowa. Cost is $75. 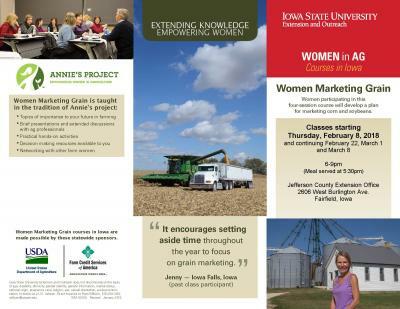 What is the Women Marketing Grain course? With unpredictable crop prices and tight margins, marketing can make the difference in the profitability of corn and soybean production. How well farmers get paid for a year’s worth of work can be wrapped up in just a few marketing decisions. In this course, women will learn how to manage price risk using tools like forward contracts, futures and options contracts, alternative marketing contracts, and crop insurance. Participants will work in a computer lab to access online decision tools and to develop a marketing plan. Women will learn market strategies and how to stay on track for long term marketing success.